The last few seasons I have spent a ton of time playing around with different cures. Personally, I only use Pautzke cures now and have came up with a mix that I feel is a great day in, day out producer when fishing for kings in Western Michigan tributaries. When fishing for salmon I’m looking for a wetter egg than most guys here are using because I feel it milks out more. 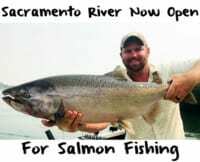 Salmon are super scent oriented fish and the smell of that egg milking out downstream gives them something to key in on. It’s no different than a drop of blood in the water for sharks. When fishing Western Michigan rivers I’ll use a chunk of skein roughly about the size of a golf ball. I want a golf ball size skein because we want that roe to milk out throughout the water column. The bigger the piece of skein, the more it will milk. The bite changes daily and while some guys just use FireCure or just a borax and salt cure the results I’ve been getting are consistent enough to keep me using the follow recipe. By using a couple different cures and scents you are doing something much different than others. Typically, I’ll use the same cure (as detailed below), but will have different Ziplocs labeled with different scents in them. One might have a krill scent added to the cure and one might have anise added. The process of curing my skeins could not be much easier. Like with any good cure you must start with fresh, blood free skeins. To get blood fresh skeins it’s importing to rip or cut the gills of the salmon immediately after being caught. This pumps the blood out of the fish. Special note: Place a paper towel in the Ziploc. This soaks up the remaining blood in the skeins. Butterfly skeins open, not cutting through the skein membrane. Place the skeins egg side up on a large piece of freezer paper (or paper towel) and sprinkle pink Fire Cure on them until the skeins are completely covered. When I first started using the Fire Cure I was really worried I would use too much of the cure and burn up the eggs. Looking back I realize I was not using enough of the cure and my eggs were lacking the punch that the cure packs. After the eggs are totally covered in the pink Fire Cure I will pick them up one at a time (I always wear rubber gloves when handling eggs) and massage the cure into every fold of eggs, adding a little cure in spots if needed. After I have done this to all the skeins I flip them over and cover the skin side of the skein with pink Fire Cure. Then I again rub it in well on each. It’s at this point I spice things up a little. Laying the skeins back on the freezer paper egg side up I very, very, sparingly sprinkle on a little red Fire Cure. What this does is give my eggs a little darker neon pink color. I’m really not looking for a dark red. Personally, I’ve had better success with a pink egg. Now that the skeins have the color I am looking for I then cover the skeins with a generous dose of natural Borx O’ Fire. What the Borx O’ Fire does is make these eggs milk like crazy, which in my opinion drives kings crazy. Place the covered skeins in Ziploc freezer bags. I only like to put two skeins in each bag so I can roll them inside the bag easier. During the next three days roll the skeins around in the bags a few times a day. Do not pour out the juice that is seen in the bag. It will be reabsorbed in the eggs. The eggs are ready to fish in three days, but will keep in the refrigerator for a month. When hitting the river I keep the Ziploc of skein in a small cooler so I can cut the perfect size chunks whenever I need them. You can also play around adding scents to the cure. I like Fire Power (pure krill powder), Pautzke Nectar or anise and will add each to different bags of cure. This has been by far my best skein cure for kings and I will not be found on the river in September without it. The effectiveness of Fire Cure has spread quickly in West Michigan and it seem everyone that is fishing kings in on our rivers is using it. 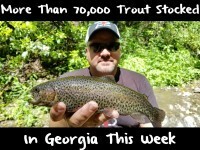 However, with just a little tweaking you can have a egg that is a little different than most others and put a few more fish in the net on most days. Editor’s Note: Kyle Buck operates Great Lakes Guide Service. 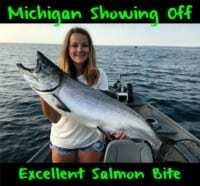 For more info on his Western Michigan fall salmon trips please visit www.greatlakesguideservice.com.